The Pental Love letterpress wedding invitation suite is modern and simple. 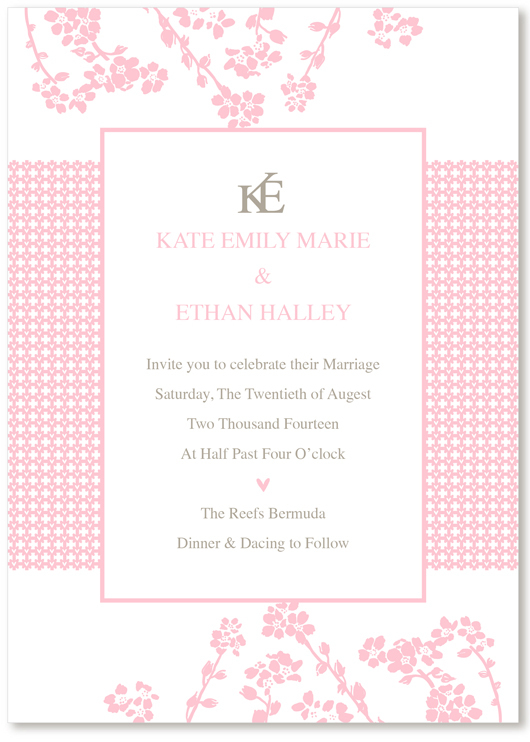 The cheerful pattern add just enough excitement to make this suite stand out while allowing the letterpress to shine. We recommend a thin, impactful sans serif fonts to complete the look! For more optional stationery, feel free to contact us. To complete a personalized order please follow these simple steps! If you need any help or have any questions, please don't hesitate to contact us ! Step 1 - Select your options in the "Customize " tab. In the "Customize " tab you will be able to choose the design style including fonts, colors, etc. for your order. Some of these options are required and others are optional. Regarding the option, “printed text”, please type the text you would like to appear printed on the card EXACTLY as you would like it printed. Review the contents and make any necessary changes before proceeding with the checkout process. We will get in touch with you through email within 1-2 working days once you've completed your order. We will review the order and answer any questions that you have. If you have any customizations that you would like to make but aren't options on the website, feel free to let us know. Next, a final design will be emailed to you for approval within 1-2 working days after your response to our email. Please make sure you review your proofs carefully before confirming a final version. Once you have signed off on your proof we will send the order to print. The order will be shipped out to you as soon as your printing is complete. The process of finalizing the personalized order is about 3-7 working days, while shipping usually takes 7 working days for the delivery.